Sports and games played in a school environment encompass more than just the benefit of physical activity. Pupils can experience increases in self-esteem and mental alertness, which can benefit children of every age. Sports and games are now an integral part of a student’s life and schools have a prominent part to play in this process. Becket Keys Church of England School is a free school established in Brentwood, Essex in 2012. It was the first Church of England secondary school to be established as part of the free schools’ programme. Their aim is a simple one – to provide a high-quality education in a caring, Christian environment in which each student is known, valued and encouraged to achieve his/her best individual potential. In addition to addressing the academic and spiritual needs of the students, their overall fitness and wellbeing would also be catered for by providing a state-of-the-art sports hall where a variety of activities could be enjoyed. 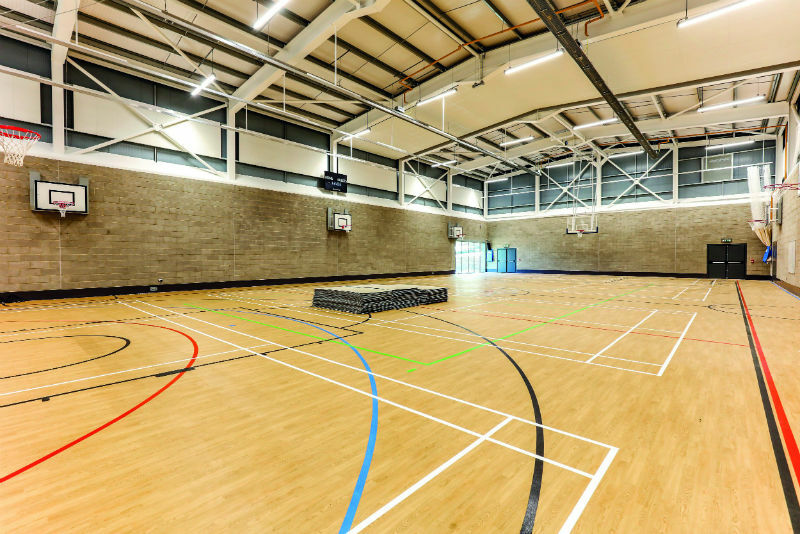 It’s an area where international flooring specialist Gerflor made a positive difference by supplying some 680m2 of its outstanding high-performance Taraflex® sports flooring in oak for the planned refurbishment of the new sports hall. The need to appoint an architect who had the experience and talents to deliver a top-quality design and finish was paramount. At Colchester-based Ingleton Wood Architects, their commissions range from large-scale new build and refurbishment projects to smaller value design and construction work. As a practice their goal is to add value at every stage of development, from initial survey and concept planning through to the design, engineering and fit-out of interior spaces. Gerflor have more than 70 years of experience with their Taraflex® sports flooring. It offers a wide range of colours and is suitable for a variety of applications. Taraflex® sports floors have been made since 1947 and used by the largest international sports federations (volleyball, handball, badminton, table tennis) for decades. Through partnerships with these federations, Gerflor has been present at the Summer Olympic Games since 1976. It’s an Olympic pedigree stretching back over an incredible 42 years. Taraflex® is available in 17 colours and three wood-effect designs. The Performance product offers a P2 category shock absorbency of 35% to 45%. Taraflex® is recognised for providing durability, safety and comfort without impairing performance. The range also offers greater than 45% force reduction, making it unrivalled in the marketplace in terms of offering comfort for users. Taraflex® meets the EN Standard of 22196 for anti-bacterial activity (E. coli – S. aureus – MRSA) (3) returning >99% levels of growth inhibition. The product is also treated with Protecsol®, which renders polish redundant and is triple-action meaning no polish is ever required, it contributes to easy maintenance and is anti-friction burn and slide/grip. Taraflex® has a double density foam backing and comes with another bonus – it’s environmentally friendly. Taraflex® Performance from Gerflor also meets the EN 14904 Standard for indoor sports surfaces. It is ideal for renovation works and is available with the Dry-TexTM System perfect for new construction or refurbishment projects with damp subfloors. Learn more about Gerflor solutions, ask for a free sample, speak to a specialist or arrange a free site survey by calling 01926 622 600, emailing contractuk@gerflor.com, or visiting gerflor.co.uk.